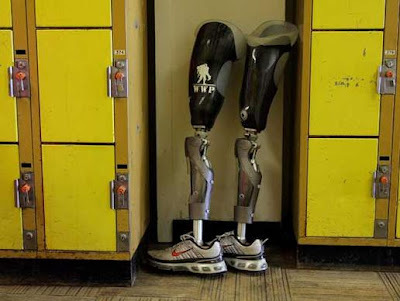 In the aftermath of the Boston Marathon bombing, the photo of Jeff Bauman Jr. being rushed to the hospital shortly after having his legs blown off brought us face to face with the grim reality that many victims of this tragedy would be undergoing limb amputation. With the Modular Prosthetic Limb, researchers from Johns Hopkins University Applied Physics Lab have successfully demonstrated the possibilities of controlling artificial limbs simply by thought. 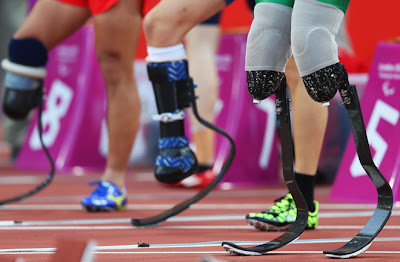 But advances in prosthetic technologies over the last thirty years have far surpassed the crude, wooden models that once made having artificial limbs such a nuisance. 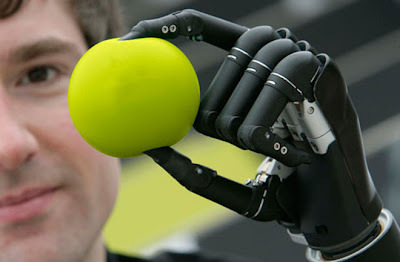 In fact, today’s robotic and bionic devices are giving amputees nearly full restoration of their lost limbs. While bionic prosthetics are more expensive on a device-by-device basis, Herr says they can help reduce secondary disabilities such as hip arthritis, knee arthritis and lower back pain that amputees often develop from using prosthetic limbs. Foot and ankle prosthetics have come a long since the SACH, the Solid Ankle, Cushion Heel, developed in the mid-1950s. Herr says there have been three eras in prosthetic limb technology. First was the SACH foot era, which stands for Solid Ankle, Cushion Heel. 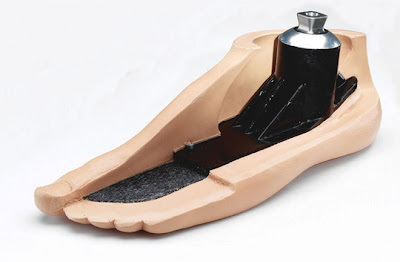 Developed in the mid-1950s, the foot typically had a wood core, with a foam and rubber outer shell. While the artificial foot gave patients more stability, it offered little lateral movement. New models of the SACH foot with titanium cores are still used today, but are only recommended for patients with a low activity level. The carbon graphite technology in the Flex Foot essentially puts a spring in the wearers step. For hundreds of years, prosthetic feet that were fundamentally similar to the SACH foot were widely used. During the 1980s, a new era began, when Herr says the Flex Foot carbon design changed that paradigm. Developed by Van Phillips in 1984, Flex Foot’s carbon graphite technology essentially put a spring in the wearers step. By storing the kinetic energy of each step, the artificial foot allowed amputees to jump, walk and run at speeds of up to 28 feet per second. 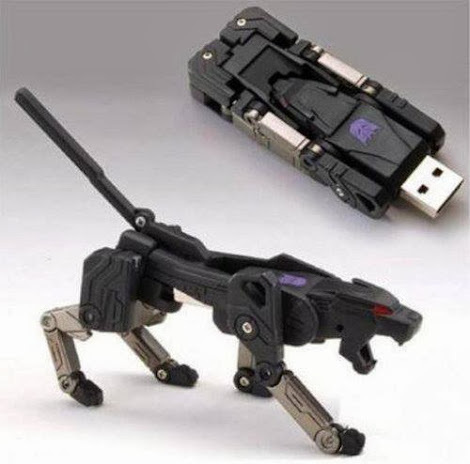 The Flex-Foot Cheetah blade is the technology’s most high performance model and primarily used for people with below-knee amputations. 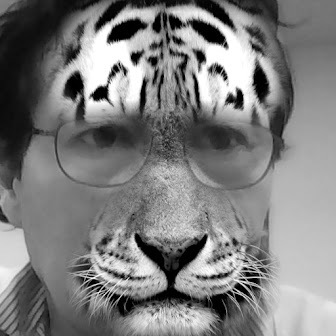 Though the cheetah blades allow wearers to run like the wind, Herr says carbon prosthetics still don’t provide a normal level of energy return. 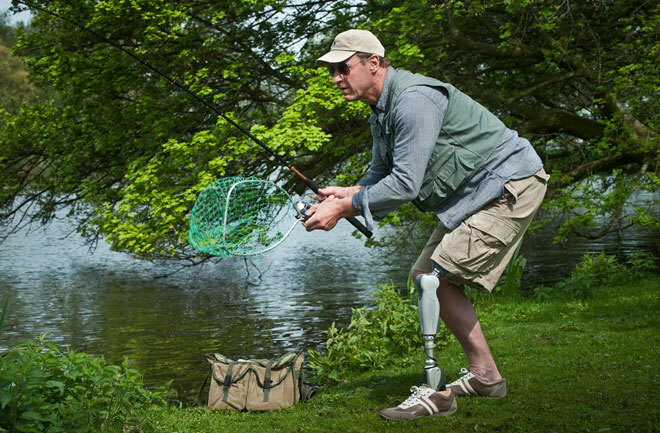 The BiOm Ankle System is the first bionic ankle-foot device commercially available for lower-extremity amputees. 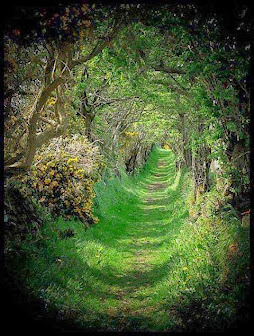 The third era is robotics or bionics, in which there’s an energy source and an actuator in the artificial limb that can produce energies greater than what a spring can produce. “For legs, we’ve just entered that era,” said Herr, whose BiOm Ankle System is a leader in the field. As the first bionic ankle-foot device commercially available for lower-extremity amputees, the BiOm Ankle System reestablishes the biomechanics of the ankle-foot function across all walking speeds. The system’s comprehensive design emulates the muscles and tendons of the human ankle joint and puts forth more mechanical energy than it absorbs. This allows amputees to walk with a more natural gait at their own chosen speed, using the same amount of energy as a non-amputee. Using three computers and six sensors BiOM’s processors are able to adjust stiffness in the ankle, spring equilibrium and propulsive torque 500 times a second. When an increase in torque is detected in the ankle joint, an actuator helps trigger more torque to modulate the foot’s push-off power, even at different velocities and inclines. 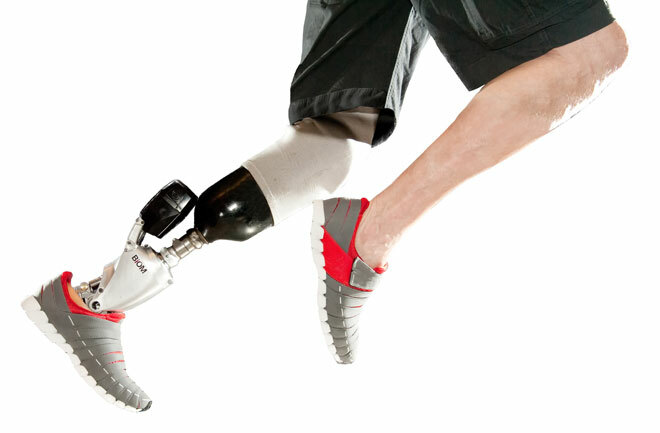 Icelandic company Ossur introduced their Symbionic Leg in 2011 as the world’s first complete bionic leg. Ossur, the Icelandic company behind the cheetah blades, introduced their Symbionic Leg in 2011 as the world’s first complete bionic leg. 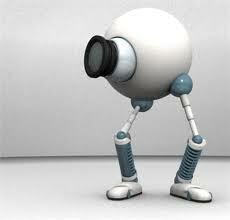 It’s a combination of Ossur’s Rheo Knee and Proprio Foot. The foot design is based on Flex-Foot technology and incorporates lightweight, durable carbon fiber packaged with Terrain Logic, an onboard artificial intelligence system that calculates sensor data and feeds it to an actuator, which then relays motion instructions to precision motors. Touch Bionics's iLimbs use muscle sensors placed on the skin of an amputees and just announced the first upper limb prosthesis controlled by a smartphone app. Developed by Touch Bionics, iLimb uses muscle sensors placed on the skin of an amputees remaining stump. The electric signals generated by the wearer’s muscles control an onboard processor that’s embedded into the prosthetic hand. This myoelectric technology gives amputees a more precise range of control and movement, even giving them the ability to pick up coins. Most recently, Touch Bionics announced their iLimb Ultra Revolution will be the first upper limb prosthesis controlled by a smartphone app. 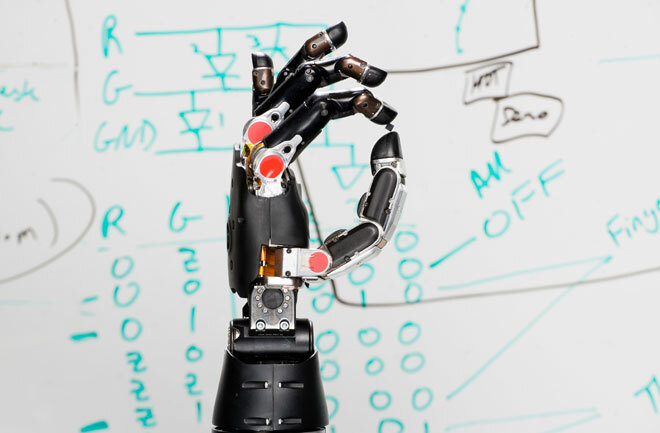 The bionic hand features four individually articulating fingers and a rotating thumb that can either be controlled by the wearer’s muscle signals or the new Quick Grip app system that automatically forms the hand into preset grip patterns. By tapping the app, users can access 24 pre-programmed motions that assist with picking up objects, grasping tools or shoe-tying, to name just three. 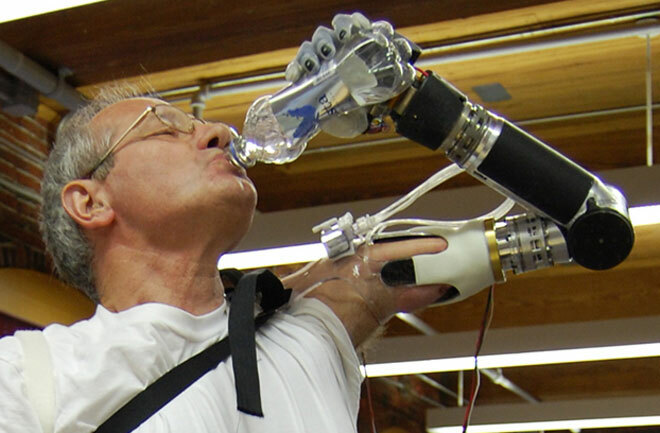 DARPA helped develop two anthropomorphic modular prototype prosthetic arms, both of which offer increased range of motion, dexterity and control options. When DARPA launched its $150 million Revolutionizing Prosthetics program in 2006, upper-limb prosthetic technology was lagging far behind lower-limb technology. Out of that program two anthropomorphic modular prototype prosthetic arms have emerged, both of which offer increased range of motion, dexterity and control options. 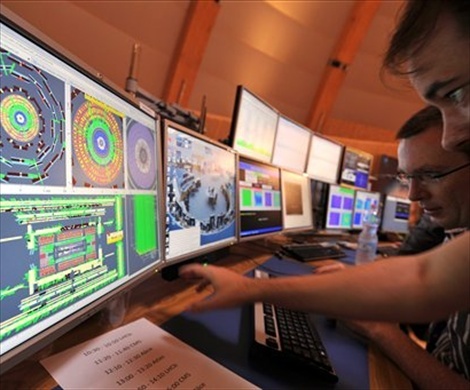 "From that program there's a number of technologies that have not been commercialized yet that I hope will be commercialized in the future," said Herr. "One, of course, is Dean Kamen's 'Luke' Arm." Nicknamed after the prosthetic worn by Luke Skywalker in "Star Wars," Kamen's DEKA Arm uses foot controls that work simultaneously with sensors in the device's sockets. Wearers use the foot controls like a joystick to access the mechanical arm’s range of motion. 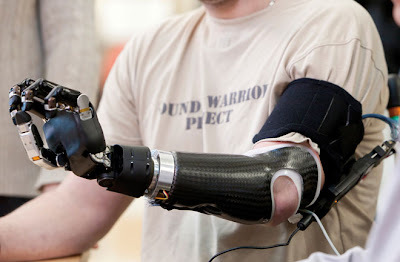 The system even provides feedback via sensors worn on the amputee’s remaining part of the limb that let wearers know how hard they are grasping an object. With a Modular Prosthetic Limb, nerves that previously went to a patient’s hand were re-routed to healthy muscles in the amputee's stump. With the Modular Prosthetic Limb, Johns Hopkins University Applied Physics Lab has successfully demonstrated the possibilities of controlling artificial limbs simply by thought. Led by Michael McLoughlin and Albert Chi, the APL’s work compromises the second prototype of DARPA’s Revolutionizing Prosthetics program. In testing the prosthetic arm, nerves that previously went to a patient’s hand were re-routed to healthy muscles in the amputees stump. Sensors on the skin picked up brain signals from those nerves, then translated those signals to the robotic arm. For quadriplegics like Jan Sherman, who was recently featured on 60 Minutes, simply re-routing nerves is not an option. Under DARPA’s program, she had University of Pittsburgh neurosurgeon Elizabeth Tyler-Kabara implant two sensors about the size of a pea on her brain. The sensors were wired to two computer connection pedestals that stuck out on the top of her head. When "plugged in," Sherman was able to move a robotic arm and hand merely with her thoughts.